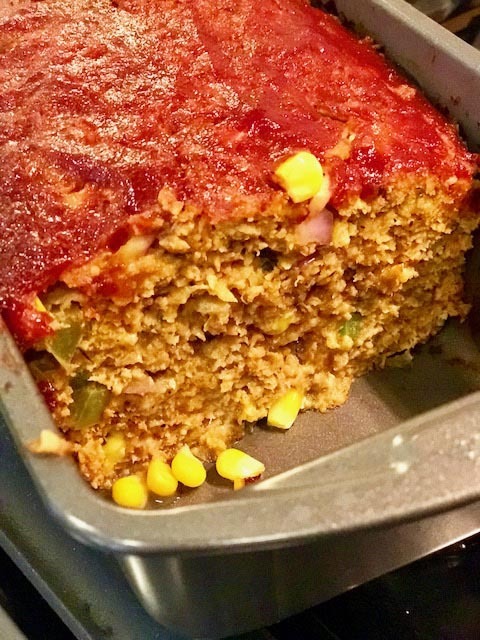 I decided to give my normal meatloaf some Mexican flare, so here is my Mexican Turkey Meatloaf recipe I made tonight. My husband and I tend to like things more spicy, but you can certainly tone down the spice if you want and it will be just as delicious. They key to a moist meatloaf is to make sure you have enough liquid in it. I use marinara sauce or ketchup in any type of meatloaf I make. The marinara sauce did not impact the flavor of the Mexican Turkey Meatloaf in a negative way either. I experimented, and it all actually worked together. 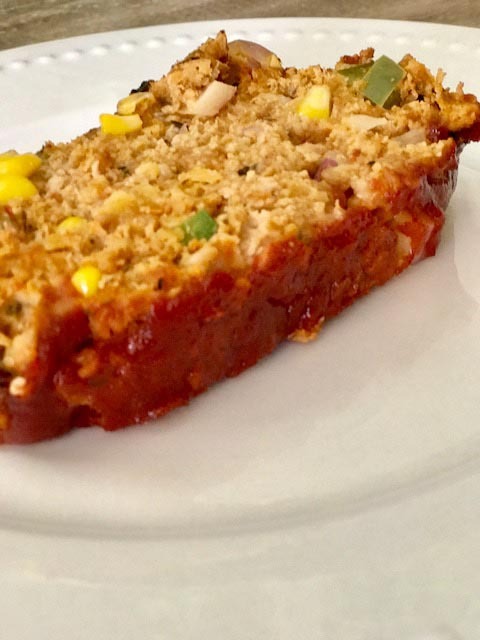 This recipe is a nice change from traditional meatloaf that your family will love! In a large bowl add the ground turkey, marinara sauce or ketchup, Worcestershire sauce and mix with your hands. 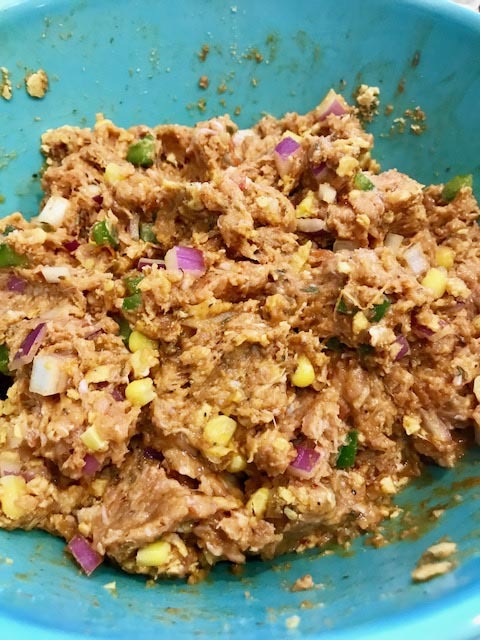 Whisk the 2 eggs and pour into the ground turkey mixture, along with the bread crumbs, onions, green peppers, corn and spices. Mix well with your hands. Spray loaf pan with cooking spray to ensure the meat doesn't stick to the bottom and sides while cooking. Add the ground turkey mixture to the loaf pan and top it off with ketchup or marinara sauce. Cook in the over for approximately 45 to 55 minutes and let cook at least 5 minutes before serving. Gluten Free Options: You can find gluten free bread crumbs at the store, or you can make them yourself. I have also ground gluten free crackers before and used instead since I always have them on hand. 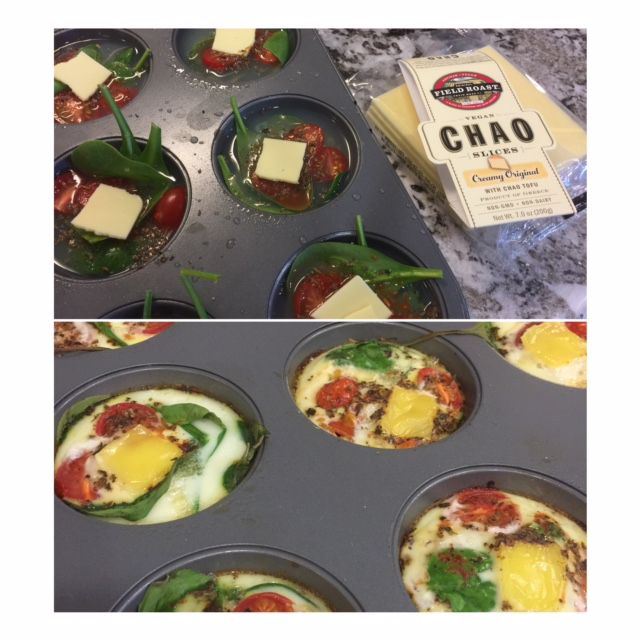 On my mission to eat healthier, I made this healthy low-carb quiche, and it turned out to be pretty tasty. Spray the cupcake pan with cooking spray and make sure you get the sides otherwise the mini quiches will not come out easily. Put a small amount of spinach in each cup. Add 3 to 4 cherub tomato halves in each cup. Pour the egg whites in each cup and leave some room at the top because the egg whites will rise a bit. Add your spices on top. Add a small amount of cheese on top (optional). Let sit for 5 to 10 minutes, and then use a knife around the edges to make it easier to get the quiches out. The Chao vegan cheese I bought was very good surprisingly (made from tofu). I only put a tiny square on each quiche as you can see on the pictures. 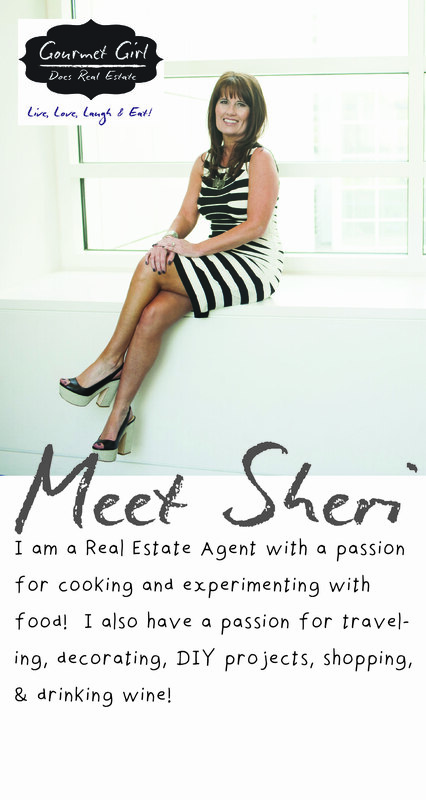 I am trying to come up with healthier recipes for the new year! I am working on being completely gluten free which has been very hard for me. Here is a really simple and healthy white chili recipe. Bake the chicken in the over for 20-25 minutes at 350. I usually coat the chicken with a bit of olive oil and salt and pepper before baking. The chicken doesn’t need to be fully done because it will be going into a crockpot FYI. Cut chicken into thin slices and place into crockpot along with the chicken broth, green chilies, beans and jalapenos. Cook in crockpot for up to 8 hours and serve. This recipe was meant for 2 people (approximately 4 servings). Double the recipe to make more. This recipe only filled my crockpot half way. 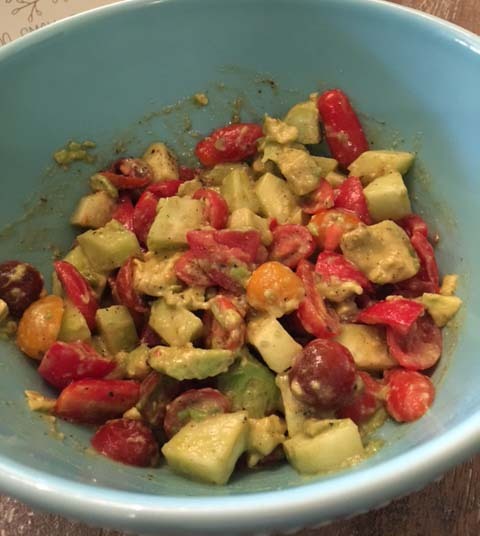 This is a super simple recipe, so you can always add more veggies if you wanted! I was on a 21 day whole body cleanse, and I could not have dairy, gluten, carbs, caffeine, sugar, and so much more! You can imagine how hard it is to eat when you have these many restrictions. I was playing with veggies, and came up with this clean salad that tasted pretty good. Make the vinaigrette and set aside. Chop all the veggies and place in bowl. Add the vinaigrette and stir. I like to use either sea salt or Himalayan salt. I made a lamb with pesto last night and it turned out great. I was doing a play on a chimichurri sauce Italian style! 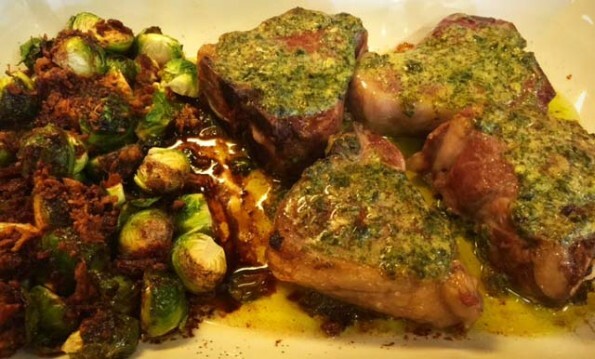 If you buy the leg of lamb chops, they are easy to cook either in the oven or BBQ. I decided to throw them in the oven and put brussel sprouts with them with a little balsamic reduction and bacon bits. The flavors blended well with the pesto. When I have time I like to make my own pesto which is just olive oil, basil and pine nuts. However, if I don’t have time I buy it. There are so many great ones out there that you don’t need to make it homemade. I coated the lamb first with a little bit of olive oil, salt and pepper. Then I coated both sides of the lamb with pesto. I also drizzled a bit of olive oil on the brussel sprouts along with a bit of balsamic reduction I made that I keep in the refrigerator. You can just use a bit of regular balsamic too. I added bacon bits that you buy in a jar. I keep that on hand when I am in a hurry. Of course, making the bacon bits yourself is always better! I cooked for 25 minutes in the over at 350. 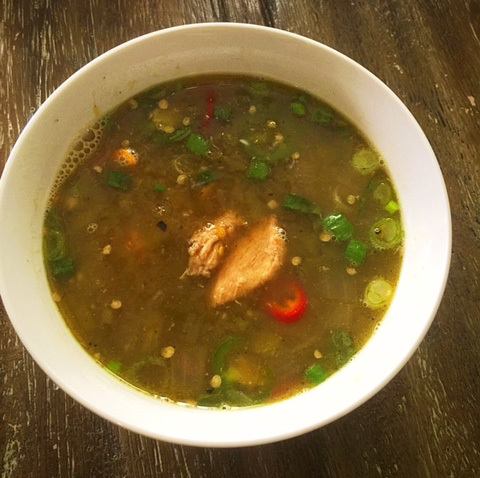 Here is my spicy Thai Chicken Soup recipe I just made tonight. 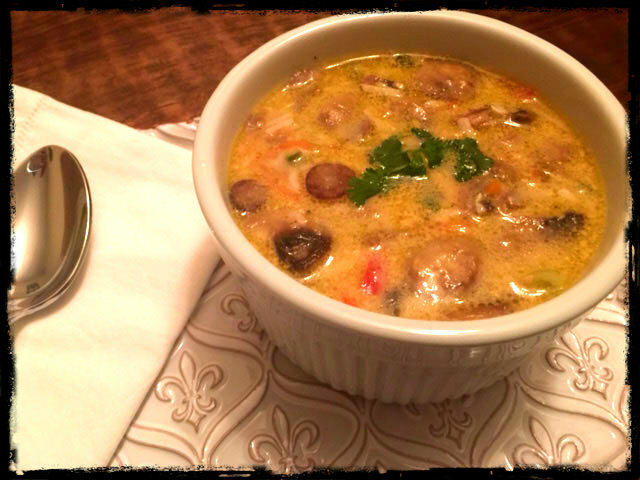 If you love spicy things, you will love this soup. Of course, you have to like Thai flavors in general and coconut milk. This really is an easy recipe to make, especially if you use some of my short cuts. Bake 3 chicken breasts at 350 for approximately 20-30 minutes with a light coat of olive oil and pepper. Once done, let cool before cutting. If you bought a roasted chicken from the store, just pull the meat off and set aside. In a large pot place the fresh ginger, garlic and mushrooms with a small amount of olive oil and cook on medium high heat for approximately 5 minutes. Add the chicken broth and coconut mile as well as all the other ingredients except for the cilantro and simmer for at least 20 minutes. Add cilantro once it’s almost done cooking. Garnish with cilantro, scallion greens or even mint leaves. This dish could also be served over white rice. I thought about putting udon noodles in the soup which I think would be great, but I was trying to keep it healthy and low-carb! Over the years I have made many variations of lasagna, but in light of trying to be healthy I came up with this low-carb lasagna that still has a lot of flavor. If you are not an eggplant fan, feel free to use zucchini or squash. You could also add them all if you wanted to. Experiment to see what you might like best. 1) Clean eggplant and cut into slices about 1/4 inch thick; pat slices with a paper towel to remove moisture; brush a small amount of olive oil on both sides of the eggplant slices; grill both sides until tender (use BBQ or grill pan on stove); remove and allow to cool for at least 10 minutes. 2) Fry meat and onions until meat is brown and onions are tender; drain fat. 3) Add tomato sauce or puree to meat mixture along with all the spices and garlic; simmer for 10-15 minutes. 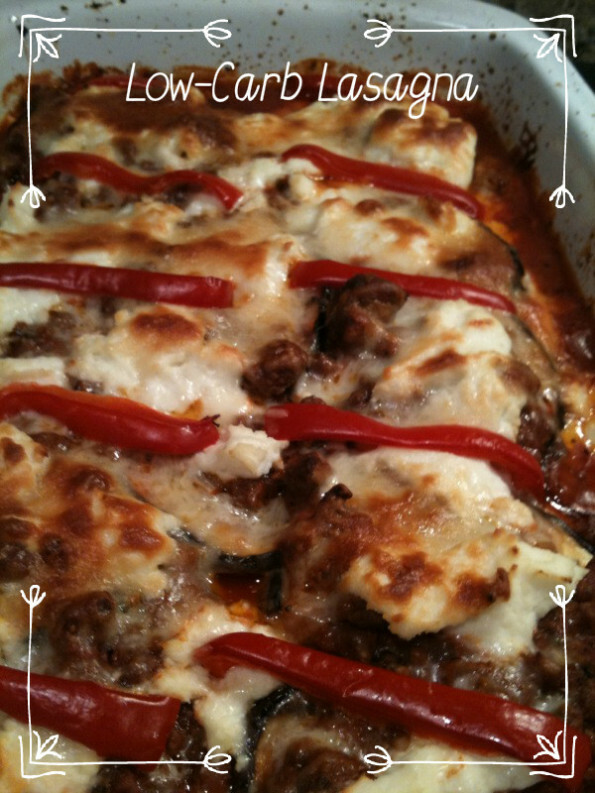 4) Coat the bottom of a roasting pan with the meat sauce mixture; layer the eggplant, ricotta cheese, mozzarella cheese and meat sauce (approximately 2 layers); top with ricotta cheese, mozzarella cheese and red bell pepper slices for garnish. 5) Heat oven to 375 and bake for 35-40 minutes.